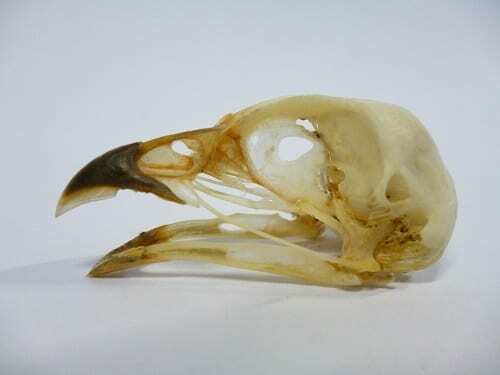 While studying this minuscule skull and mandible, with its translucent eye-sockets and brittle beak, this partridge seemed to me pretty far removed from the plump and regal image of a partridge in a pear tree with which I am familiar! However, this specimen could be up to 180 years old, so with the help of some imagination hopefully this blog will bring the specimen some metaphorical colour and plumpness…! As you may know, partridges are medium-bodied gamebirds (around 28 – 30 cm long), recognisable for their short, curved bills, small heads and short legs. 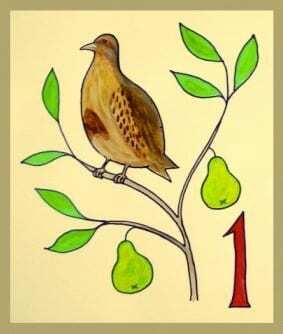 At this time of year you may find a partridge in a pear tree as their diet is mainly made up of leaves, seeds and insects. In the UK the most common partridges are Red-Legged Partridges (Alectoris rufa) which were introduced from Continental Europe to the UK in the 1600s by Charles II to use as target practice. Today the Red-Legged Partridge has overtaken the native Grey Partridge (Perdix perdix) in population and sadly the latter partridges now have a red conservation priority status. 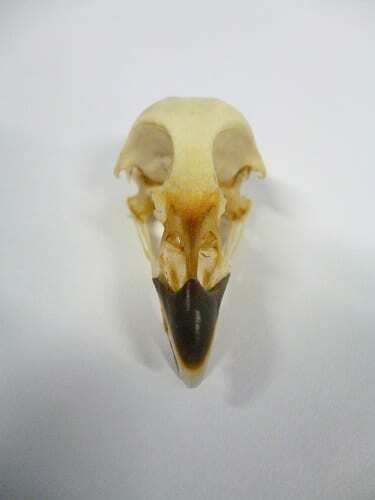 With the help of the Grant Museum’s curator Paolo Viscardi and the really informative website Skull Site we were able to identify that this cranium and manible belong to a Daurian Partridge (Perdix dauurica) owing to the skull’s size (46mm). This is smaller than that of Red-Legged Partridges which on average measure around 55mm. Our specimen’s skull size could thus only be attributed to Grey Partridges or Daurian Partridges. While the former is native to the UK and therefore perhaps a more obvious choice, the length of the end of the mandible associates this skull more closely with that of the latter species. 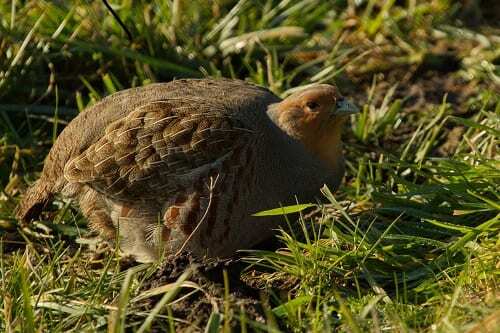 So there we have it before our very eyes, a Daurian Partridge. While the brown backs of Daurian partridges may not make them easily identifyable, their noticable orange faces and orange bristly ‘beards’ in the breeding season clearly mark them out from other partridges. The remainder of Daurian Partridges heads and underparts are predominantly grey with a striking black stomach area. The female has a smaller black stomach patch and is generally duller in colour than her male counterparts. 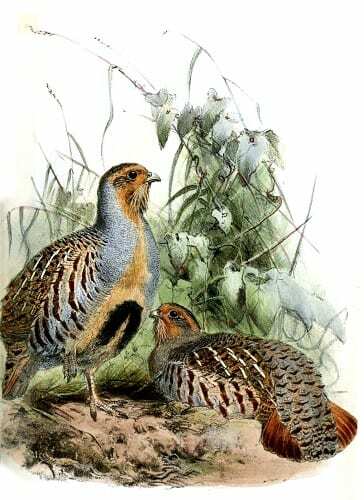 Young Daurian partridges are identifiable by their predominantly grey-brown colouring and lack of orange facial markings or black stomach stripe. Unlike the Grey and Red-Legged Partridges, you’re unlikely to see a Daurian Partridge in a hedgerow near your house (if you live in the UK that is). The name ‘Daurian Partridge’ tellingly derives from the Dauria region of Russia, which is where this species can be found as well as upon farmland across much of temperate eastern Asia such as Kyrgyzstan, China and Mongolia. The Daurian Partridge is a non-migratory terrestrial species. Interestingly some areas of its geographical range overlap with the Grey Partridge, with which it forms a superspecies and is very closely related. The global population of Daurian Partridges has not been specifically quantified, but it has been estimated that the population sizes of the breeding pairs in China are around c.100-100,000 and that there are c.10,000-100,000 breeding pairs in Russia. Unfortunately the wide range of these population estimates, especially of the Chinese population, mean it is difficult to get an accurate grasp on the current number of Daurian Partridges in existance! However, such positive breeding numbers do mean that the Daurian Partridge has been attributed the Least Concern Conservation Status. The Grant Museum has a covey of no less than 16 partridge specimens including Grey Partridges and Red-Legged Partridges in the form of craniums and mandibles, feathers, wings, tail feathers, metatarsals, phalanges and a 14 day old embryo. Interestingly this is also just above the average number of partridges which generally group together in the wild, which is believed to be between 6 – 15 partridges. Collectively such groups of partridges are known as coveys, as you may know if you follow our PAW (Plural Animal Wednesday) posts on Twitter! To find out interesting facts and figures like this about the Grant Museum’s wonderful collection of specimens I heartily recommend you visit the museum’s online catalogue. Encyclopedia of Life. 2015. Perdix dauurica Daurian Partridge [online]. Available from: http://eol.org/pages/1047274/details [Accessed 02 December 2015].